Hello Lovelies! 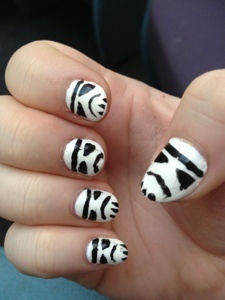 Welcome to week 7 of our Mani challenge and this week the theme is Black & White. I have done B&W nails before in the form of the band And So I Watch You From Afar (ASIWYFA)'s logo. 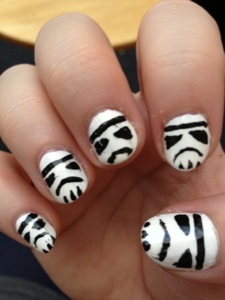 This time I went for a different aspect of my geekiness and attempted to do Stormtroopers from Star Wars. I say attempted. They kind of look more like INCA-angry-cat-stormtrooper-mummies. Check out the index finger, how much does he look like angry cat? I have to say I purposely experimented with these using a small fine brush rather than my usual Nail art pen/striping brush to see whether it makes a difference and, obviously, it does. I'll be returning to those for next time most definitely. Anyway! Success or not I like it and I've been getting some interesting looks in work today as people try to work them out from a distance! Don't forget to check out Instagram for contributions from Gayle @kaspanda86. 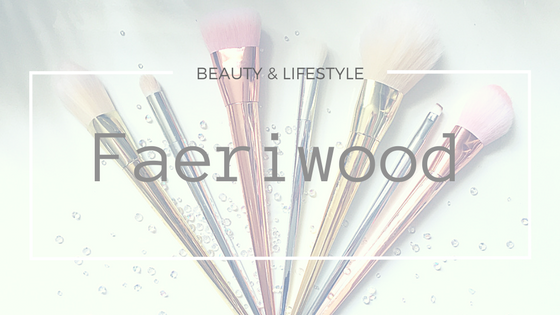 You can also find, me @faeribex, Bex from www.bexberry.com is @bexberrymua, Caroline from Www.reddutchess.blogspot.co.uk is @mademoisellerouge and Jen from http://jenlingyang.blogspot.ca/ is @jenlingyang. And as usual be sure to tag one of us so we can see your contributions! haha totally is Angry cat!! !